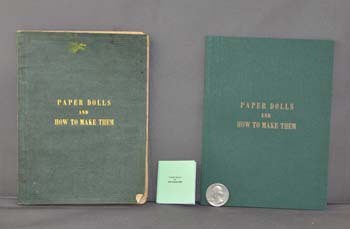 With the exception of the color of the cover and its size, this book is identical to the book Paper Dolls and How to Make Them which is discussed in the sections on dolls as well as being included in the listing of 19th century reproduction books. Although it is only 1 3/4 inches tall, if your eyes can read very small type (or you use a magnifying glass) you can read the book! This would be a wonderful addition to the bookshelf of a doll. 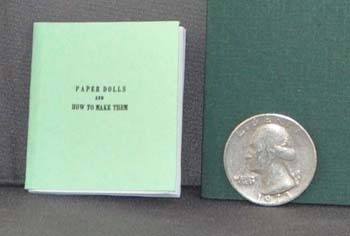 For reference, in the picture on the left we have shown an original of the book, a full-size reproduction (which can be viewed in more detail by clicking here), and the miniature reproduction. In the picture on the right, we show a closeup of the reproduction. In both pictures, a quarter is included for scale.